New Bremen's Ryan Bertke hits during a nonconference game on Tuesday in New Bremen. 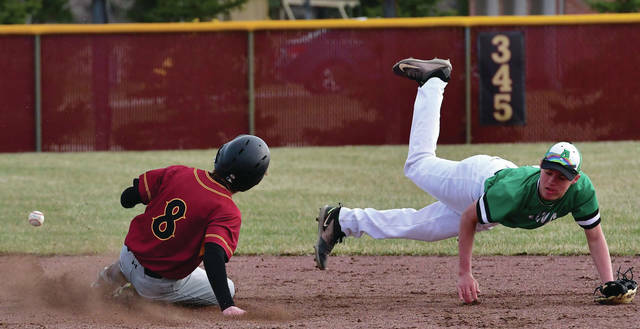 New Bremen's Jarod Keller steals second base during a nonconference game on Tuesday in New Bremen. New Bremen's Spencer Alig pitches during a nonconference game on Tuesday in New Bremen. Anna's Carter Elliott catches a fly ball during a nonconference game on Tuesday in New Bremen. New Bremen's Mitchell Hayes rounds third base during a nonconference game on Tuesday in New Bremen. 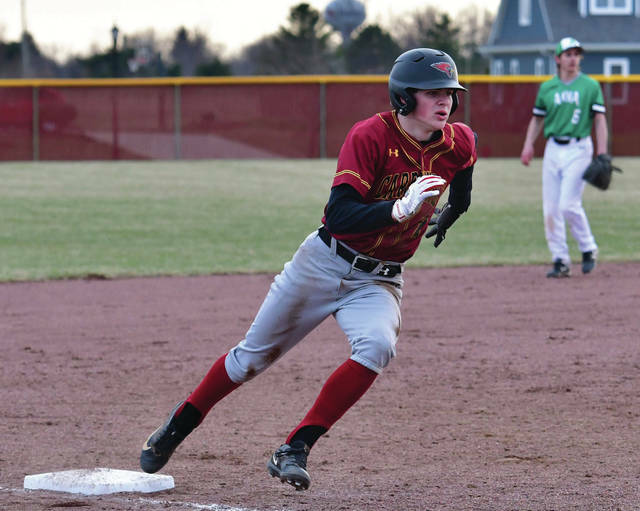 NEW BREMEN — After Anna tied a nonconference baseball game with two runs in the top of the sixth, New Bremen scored one in the bottom of the inning to re-take the lead and then held on to earn 7-6 win on Tuesday. 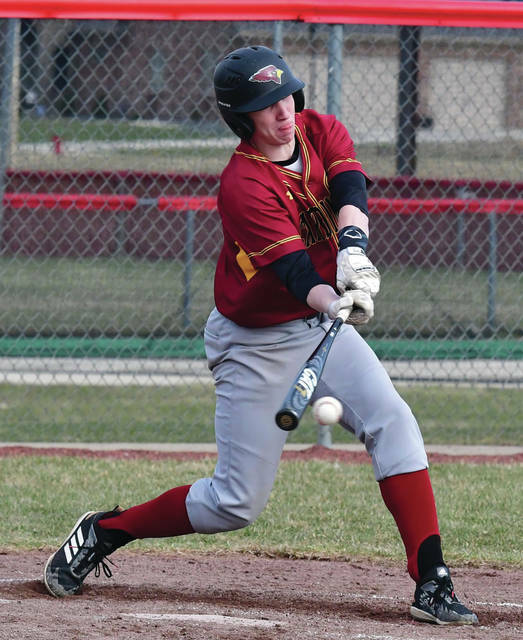 New Bremen had six hits and four errors while the Rockets had four hits and four errors. Anna scored four runs in the second but New Bremen scored two in the third and four in the fourth to take a 6-4 lead. Jarod Keller was 2 for 3 for New Bremen and stole two bases. Justin Tenkman had 2 RBIs and Mitchell Hays stole two bases, while Zach Bertke, Tyler Overman, Grant Selby and Bryce Blickle each stole one. Tenkman picked up the win on the mound. He struck out three batters in 1 1/3 innings and didn’t allow a hit. Spencer Alig started and didn’t allow an earned run. He gave up four hits and two walks in 5 2/3 innings and had eight strikeouts. Kyle Evans was charged with the loss for Anna. He gave up one earned run on two hits in two innings and had one strikeout. Jacob Robinson started and allowed four earned runs on four hits and three walks in four innings. He had three strikeouts. Brandon Shannon and Brayden Collier each scored two runs for Anna. Shannon was 1 for 3 with one walk. Shannon and Collier each had one stolen base, as did Wil Luthman. The Red Devils earned their second consecutive big win over Sidney in as many days in a Greater Western Ohio Conference American North Division game on Tuesday in Sidney. Tippecanoe took control with three runs in the second inning. The Red Devils scored one in the third and two in the fifth, then ran away with six in the seventh. Sidney had three hits and no errors while Tipp had 12 hits and two errors. Lathan Jones, Brandan Rose and Mitch Larger each had singles for the Yellow Jackets. Ben Spangler picked up the loss. He allowed four earned runs on five hits and five walks in four innings. He had five strikeouts. Fairlawn’s Doug Wright and Dalton France combined to pitch a no-hitter as the Jets earned a big nonconference win in New Knoxville on Tuesday. Wright started and struck out 11 batters with four walks in six innings. Dalton France closed it out and allowed one earned run on three walks in the seventh but didn’t give up a hit. Fairlawn had eight hits and didn’t commit an error; the Rangers committed eight errors. Keith Orndorff was 3 for 4 with two runs while Wright was 2 for 4 with 2 RBIs. Drew Maddy drove in four runs. Orndorff stole five bases while Maddy, Jordan Lessing and Skyler Piper each stole two. The Wildcats picked up a run-rule win in five innings on Tuesday in Houston. They had six hits and one error while Ansonia had five hits and five errors. Howie Ludwig was 2 for 4 with 3 RBIs and two runs for Houston while Devin Baker was 2 for 3 with 3 RBIs and two runs. Ludwig hit a double and Jacob Leist had a double. John Leist picked up the win on the mound. He gave up four hits and no runs in three innings and had three strikeouts with two walks. Noah Baltes pitched two innings and allowed one earned run on one hit. 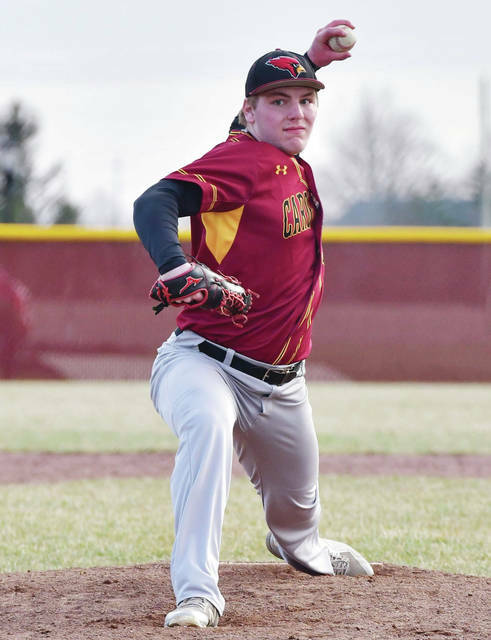 The Flyers managed just one hit against Fort Loramie starter Jared Middendorf on Tuesday as the Redskins stayed undefeated with a home nonconference win. Fort Loramie had four hits and no errors; the Flyers had two errors. Ben Barhorst was 2 for 3 with 1 RBI for the Redskins. Devin Wehrman also drove in a run. Middendorf struck out nine batters in seven innings and allowed two walks. The Raiders lost a road nonconference game on Tuesday. Russia had two hits and three errors while the Cavaliers had 14 hits and no errors. Jordan York picked up the loss on the mound. He allowed three earned runs in 2 1/3 innings on five hits and four walks. York and Zach Bergman each had a hit for the Raiders. Elgin had a 4-2 lead through four innings but broke it open in the fifth and earned a run-rule win over Lehman in a Northwest Central Conference game on Tuesday in Sidney. The Cavaliers scored seven runs in the fifth to break the game open. Jared Magoteaux picked up the loss for the Cavaliers. Alex Keller had a double. The Pirates scored two runs on four hits in the top of the seventh inning and held off Ridgemont in the bottom half to earn a road NWCC win on Tuesday. Riverside had eight hits and two errors while Ridgemont had nine hits and no errors. RJ McGowan picked up the win for Riverside. He pitched a complete game and gave up nine hits and two unearned runs. He had eight strikeouts and two walks. Harley Asbury was 2 for 4 with 1 RBI. He hit a double, as did Kale Long. Levi Godwin hit a triple and had a stolen base. The Tigers hit four home runs and won a high-scoring nonconference game on Tuesday in Dayton. Versailles, which took a 3-0 lead in the first and never trailed, had 14 hits and no errors. Oakwood had nine hits and three errors. Zach Griesdorn picked up the win for Versailles. He allowed nine earned runs in 5 2/3 innings on nine hits and nine walks. He had six strikeouts. Griesdorn was 3 for 4 at the plate with 3 RBIs and three runs. He also had two stolen bases. Brayden Robinson was 3 for 5 and scored three runs. Andrew DeMange, Will Eversole and Nathan Wagner each had two hits. Eversole had a double and hit a home run. DeMange, Griesdorn and Garrett Toops also homered. Anna’s boys track and field squad won a quad meet at Marion Local on Tuesday. Boys team scores were Anna 93, Marion Local 76, Lehman Catholic 3. Jeffrey Richards was first in the 100 meter dash in 11.46 while Ian Bollheimer was first in the 200 dash in 23.78. Lucas Smith won the 1,600 run in 5:15.60 and the 3,200 run in 11:30.96. Alex Bruggaman was first in the 110 hurdles in 16.19 and Colton Nanik was first in the 300 hurdles in 43.59. The Rockets were first in the 400 relay in 46.49, first in the 800 in 1:38.41, first in the 1,600 in 3:56.29 and first in the 3,200 in 9:26.0. Girls team scores were Marion Local 74.5, Anna 66.5, Lehman Catholic 34. Anna’s Hope Bixler won the 3,200 run in 14:07.72. Hannah Shoemaker won the 100 hurdles in 16.52 and the 300 hurdles in 47.23. Shoemaker also won the pole vault by clearing 8-6. Shana Roe won the high jump with 4-8. Lenna Rowland won discus with a throw of 99-2. Lehman Catholic’s Lindsey Magoteaux won each event she competed in. Magoteaux was first in the 100 dash in 13.12, first in the 200 in 27.6 and first long jump with a leap of 15-11. Lehman’s other win came in the 400 relay where Magoteaux teamed with Lauren McFarland, Ella Monnin and Rylie McIver for a winning time of 53.06. Fort Loramie’s boys and girls track and field teams won a home tri meet on Tuesday. Boys team scores were Fort Loramie 93, Versailles 53, St. Henry 29. Fort Loramie’s Gavin Kemper was first in the 110 hurdles in 17.66. Carson Moore won the 100 dash in 11.94. Jake Rethman won the 1,600 run in 4:55.6 and the 3,200 in 10:57.44. Carson Moore won the 200 dash in 24.38. Connor Raterman won shot put with 44-7 and Collin Detrick won discus with 139-1. Charles Wray won long jump with 17-8.75. The Redskins won the 3,200 relay in 8:59.25, the 1,600 in 3:46.35 and 800 in 1:37.38. Versailles’ Cole Luthman won the 400 in 55.34. Luke Billenstein won the 300 hurdles in 46.64. The 400 relay won in 50.54. Girls team scores were Fort Loramie 76.5, Versailles 61, St. Henry 26.5. Fort Loramie’s Alyssa Wrasman was first in the 100 hurdles in 16.70, the 300 hurdles in 50.44 and the high jump with 5-0. Olivia Borchers won the 3,200 run in 13:12.51. Hannah Siegel won shot put with 32-4.5. The Redskins won the 3,200 relay in 10:48.24, the 1,600 in 4:28.2, the 800 in 1:56.0 and the 400 in 56.0. Lucy Prakel led Versailles by winning the 200 in 28.26 and pole vault with a leap of 10-6. Also winning were Kesley Francis in the 100 in 14.22, Madelyn Holzapfel in the 1,600 run in 6:01.2, Liz Watren in the 400 in 63.48 and Haley Mangen in discus with 82-1. Houston’s boys track and field team won a home tri meet on Tuesday while the girls finished second. Boys team scores were Houston 90, Fairlawn 54 and New Knoxville 23. Houston’s Tristin Freistuhler swept the 1,600 run 4:50.32 and the 3,200 in 11:13.17 while Brandon Pollock won the 110 hurdles in 18.77 and 300 hurdles in 47.65. Ethan Knouff won the 800 in 2:06.11. The 800 relay finished first in 1:44.12 and the 1,600 relay was first in 3:53.95. Fairlawn’s Jackson Jones won the 100 dash in 12.0. He also the high jump with 6-0 and long jump with 17-11. Alan Asher won the 400 dash in 55.13 and the 200 dash in 24.58. Garrett Smail won pole vault by clearing 9-6. The Jets won the 400 relay in 47.20. Girls team scores were New Knoxville 81, Houston 50, Fairlawn 31. Houston’s Hollie Voisard won the 1,600 in 6:16.17. The 3,200 relay won in 11:08.47. Fairlawn’s Madison Huelskamp won the 100 hurdles in 18.18 and the long jump with 14-9. Myla Cox won the 3,200 run in 13:57.0. The Cavaliers lost a road match on Tuesday in West Milton. At first singles, Milton-Union’s Nathan Brumbaugh defeated Danny Lins 6-0, 6-0. At second singles, Nick Brumbaugh defeated Sam Gilardi 6-2, 6-0. At third singles, Peyton Brown defeated Max Schmiesing 6-0, 6-1. At first doubles, Jake Swafford and Nathan Black defeated Elias Bezy and Elijah Jock 6-3, 6-1. The Cavaliers’ lone win came at second doubles, where Sean Toner and Cole Kramer defeated Luke Barnes and Will Morris in three sets, 6-1, 5-7, 1-0 (10-7). “Milton-Union is one of the top teams in our area,” Lehman coach Tim Ungericht said. “Their first and second singles players are returning state qualifiers in doubles from last year and their first doubles team was a seeded team at sectionals last year as well. New Bremen’s Ryan Bertke hits during a nonconference game on Tuesday in New Bremen. 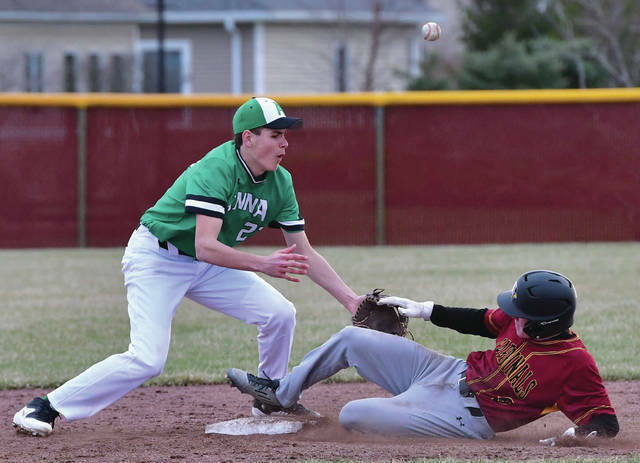 New Bremen’s Jarod Keller steals second base during a nonconference game on Tuesday in New Bremen. New Bremen’s Spencer Alig pitches during a nonconference game on Tuesday in New Bremen. Anna’s Carter Elliott catches a fly ball during a nonconference game on Tuesday in New Bremen. 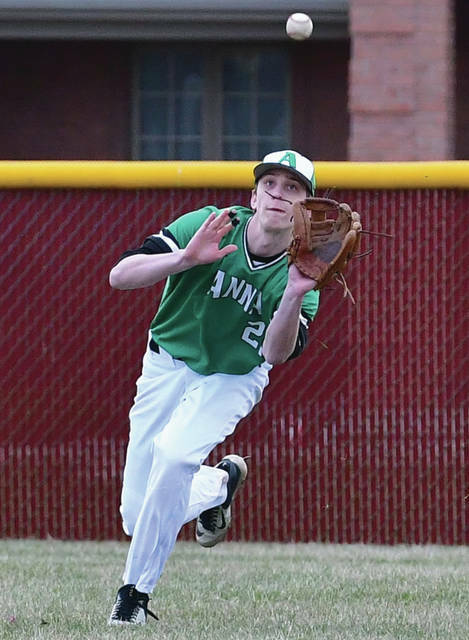 https://www.sidneydailynews.com/wp-content/uploads/sites/47/2019/04/web1_DSC_1113.jpgAnna’s Carter Elliott catches a fly ball during a nonconference game on Tuesday in New Bremen. New Bremen’s Mitchell Hayes rounds third base during a nonconference game on Tuesday in New Bremen.